Osteoporosis can negatively impact your hearing. Most of us expect to have things change as we age: an increase in medical issues, a decrease in our ability to move freely and comfortably, and diminishing hearing and eyesight. There are many health conditions that have long been known to have a connection to your hearing health, such as dementia, diabetes, heart disease, and chronic kidney disease. But another disease that has been recently linked to sudden sensorineural hearing loss (SSHL) is osteoporosis. In fact, one study shows that having osteoporosis nearly doubles a person’s chances of having SSHL. What exactly is osteoporosis? It’s a condition where bones weaken and become more susceptible to breaking. Normally old bone is replaced by new bone in the body so that it stays strong and healthy. In a person with osteoporosis, that process slows down, so that more of there bone material if older and more fragile. This leads to breaks and fractures from activities that would normally not harm strong bones, especially in areas like the hips, wrists and spine. Osteoporosis is influenced by many factors including, race, gender, and age, but also seems to be less likely in people who have lived a healthy lifestyle, by heating well and not smoking. Adopting a light exercise routine can also help to limit your chances of developing osteoporosis. SSHL is a relatively common condition (sometimes also called sudden deafness). 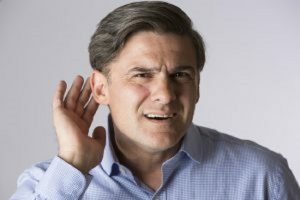 It is seen as a very rapid loss of hearing ability over a couple of days or occasionally in an instant, not the gradual deterioration of hearing health we associate with growing older. More often than not it affects one ear, not both and sometimes it is accompanied by ringing in the ears or dizziness. If you experience SSHL, get help right away for the treatments to be the most effective. So does Osteoporosis cause SSHL? It’s too early to say, but scientist do acknowledge a connection. We’ve long known that the two at least show a correlation, and as mentioned above a recent study in Taiwan has shown that individuals with osteoporosis have nearly twice the likelihood of developing SSHL. Take care of your bones and your ears. If you have a family history of osteoporosis, be proactive about protecting your bone health. And if you have osteoporosis (or even if your don’t), be proactive about your hearing health: get regular hearing checks to catch changes and problems early. Contact Bay Area Audiology Today for Your Hearing Aid! This entry was posted on Friday, January 18th, 2019 at 12:00 pm. Both comments and pings are currently closed.